Swaraj Abhiyan crusaders today in hundreds were put in Police detention for a Protest outside Vidhan Sabha against the `revised 420` Lokpal Bill of AAP. Congrats to CM-Delhi for his 420 Lokpal bill as he joins PM Modi in the Indian `Hitler Club` as felt by several of his old die hard bhakts. While several danced and celebrated on passing of this handicap bill. Prashant Bhushant in a recent Press Conference exposed Arvind Kejriwal dictatorial style of running Delhi Government. “Falsehood & lies are being shamelessly spread by AAP in the name of Lokpal Bill, whereas serious concerns not being addressed”– chips in Prashant Bhushan. If the Delhi CM had place the same Janlokpal drafted and edited 13 times during Anna Movement now without any change then why should Arvind Kejriwal take almost a year to make up his mind and now try place a distorted version? This debate shall be good for transparency and shall be in the interest of people. “It is unfortunate that rather than addressing the straight questions on pointed aspects of the Lokpal Bill, the Aam Aadmi Party appears to adopt falsehood. As per various media records, the AAP and its spokespersons repeatedly said that the bill is identical to the Delhi Janlokpal Bill, 2014 of previous AAP government of 49 days. The party even went on to release a press statement terming the present bill, which is call a Jokepal. Prashant Bhushan displayed a copy of the Delhi Janlokpal Bill, 2014 (Bill no 02 of 2014), which the Aam Aadmi Party claims is similar to the Delhi Janlokpal Bill, 2015. Conflict says that this claim of AAP is a naked false. In terms of spreading falsehood & propaganda, the Aam Aadmi Party has reached a level where it should now think of having a ministry of Propaganda in line with Hitler Ministry nailed Bhushan. 2014 Bill – It had the provision for an independent Investigation and Prosecution Wing to be constituted by the Commission. 2015 Bill – No investigative machinery has been given to or placed under Lokpal as per the section 10 of the proposed bill. This means that the Lokpal will have to carry its investigations through officers and machinery provided by governments. Needless to say the investigating officers would obviously be under the control of governments which provide the investigators. 2015 Bill – Section 7 of the Bill says, “Janlokpal may proceed to inquire or investigate into the allegation of corruption occurring in the National Capital Territory of Delhi.” As per the proposed bill, jurisdiction of the Lokpal would be to investigate any corruption offence in Delhi, be it various agencies and functions under the central government. It means that the state Lokpal can investigate the central government as well. It is a sad day to see Aana Movement and AAP Old Champions of Lokpal leveling charges which de-motivates people. A quick glance at Khabar NDTV primetime debate with Ravish. Raghav-AAP the opening batsman found fumbling at loss on straight forward questions. The AAP govt should have sent a lawyer to argue the points with valid answers. Who authorized this Raghav Chaddha to talk about Lokpal when he was missing in Anna Movement? If AAP High Command is serious about the movement that brought them here then they should not shirk away from open discussions including their volunteers. That was one of Anna Movement main contention with other political parties when they were in activism. Now in power AAP seem to be adopting the same tone. Based on above evidences, It is disheartening to understand that AAP is hobnobbing not for a `Weak Lokpal` but for a compromised loyal Lokpal that can be controlled only by Delhi Government. Anti-Corruption stakeholders including the public need to stand tall with promises made during Anna Movement. 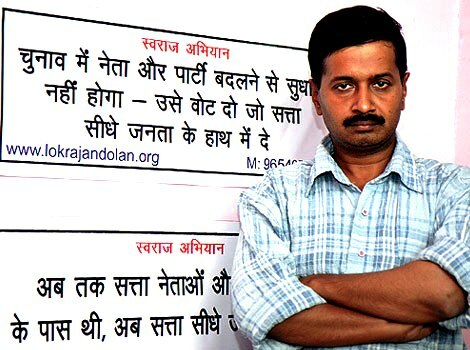 The present Maha-Joke Pal Bill of Delhi Government remains an open compromise with corruption. Tolerance Vs Intolerance -Global Game controlled by 1%?